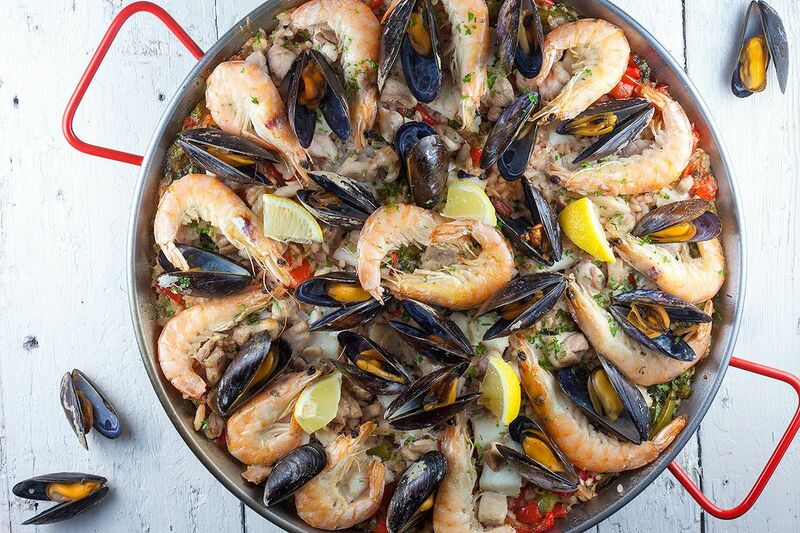 Don't you just love paella? Everything in one large pan, preferably in the open air, but can also be made inside. It looks pretty too, so dig in! PEEL the onion and garlic cloves and chop them as fine as you can. REMOVE the seeds from the peppers and chop half of them into cubes and half of the peppers into thin strips. REMOVE any excess fat or muscles from the chicken thighs and chop them into bite-size pieces. RINSE the parsley and finely chop it. 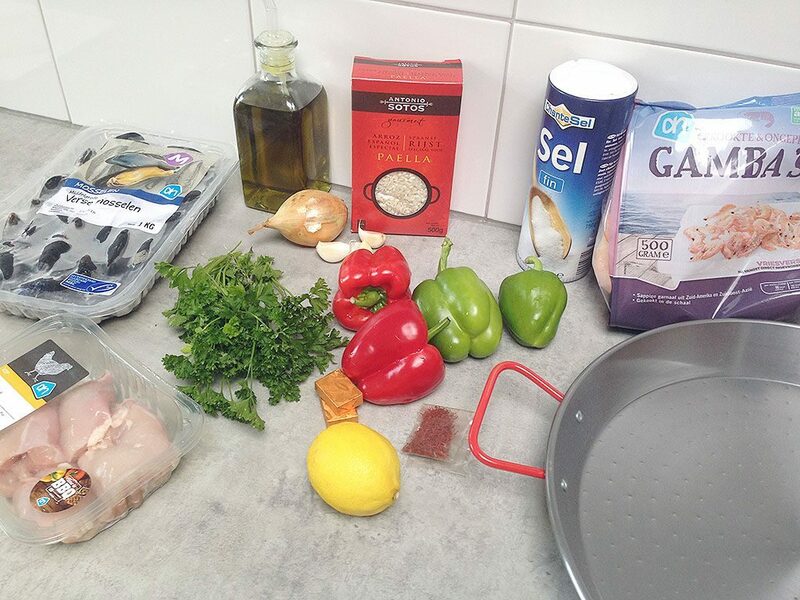 HEAT olive oil in the paella pan and start with the chicken pieces. COOK them for a few minutes and TRANSFER them to a bowl and set aside. If your shrimps aren’t pre-cooked, you can saute them for a few minutes in the paella pan as well. FILL the medium-sized pan with about 1/2 liter of water and bring to a boil. Again HEAT olive oil in the paella pan and saute the chopped onion and garlic for a few minutes. ADD the red and green peppers and saute a few minutes more. ADD the paella rice and saute for another few minutes. Meanwhile cook the mussels in the pan with water until they’re all opened up, this will only take a few minutes. TRANSFER the mussels to a bowl and set aside. Let the saffron soak in the hot mussel water for a few minutes. POUR the water of the mussels into the paella pan along with the chicken stock and juice of half a lemon. Bring the paella to a boil. Meanwhile PRE-HEAT the oven to 180 degrees celsius or 350 degrees fahrenheit. You can also choose to cook the rice on low heat, make sure to add some extra liquid and check it carefully. ADD 3/4th of the chopped parsley to the rice and season with salt. 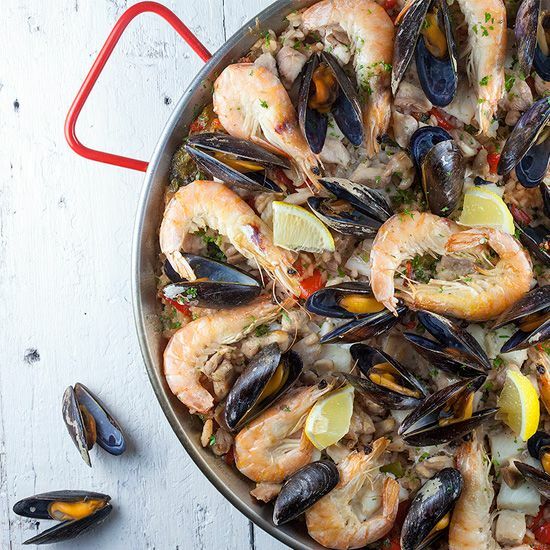 ARRANGE the mussels, shrimps, pieces of cod fillet and chicken pieces on top. PLACE the paella in the oven, or on low heat, until the rice is done and all the moisture has evaporated. That will take about 10 minutes. Finish the paella with lemon pieces and the rest of the chopped parsley. Enjoy!